The chainsaw is a complex machine with many different parts and features that work together. Chainsaw parts thus refer to the numerous parts required for the safe and smooth operation of a chainsaw. Many homeowners and occasional chainsaw users barely know even a quarter of the parts that make up their chainsaws. Why is this important? First and foremost, there are chainsaw parts that are a prerequisite by law. Chainsaw manufacturers must meet the safety requirements of gasoline powered chains and ensure that all chainsaws produced are fitted with the parts required by the Occupational Safety and Health Administration. Below are some of the reasons why you need to know the parts of your chainsaw. A chainsaw is a very dangerous tool which can cause serious injuries and even death. There are several parts that you must ensure that your chainsaw has in order to minimize the chances of accidents and injuries from occurring. If you know how all the parts function, you can be able to tell when one is not working as it should and be able know when to have it checked and replaced. A maintained chainsaw will be less risky to use and it will give you service for many years. Knowing the parts of your chainsaw is essential for maintenance. If you don’t know the different parts and how they work, you cannot be able to maintain your chainsaw as you should which can be both costly and unsafe. When you need to replace a certain part of your chainsaw, it can be difficult to order it when you don’t really know what it is called. Knowing the different parts of the chainsaw will enable you to communicate with your mechanic or supplier well. Below are some of the common parts of a chainsaw that are essential for safety and good performance. The saw chain in itself has several other parts which include; cutter teeth, rakers (also known as depth gauge), the tie strap and the drive link. 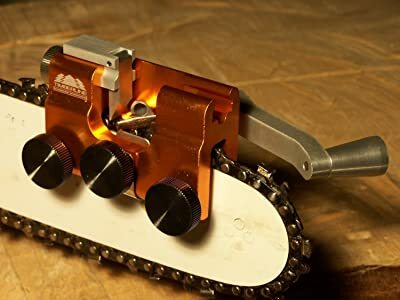 These parts are essential for cutting, controlling the depth of the cut, holding the different parts of the chainsaw together and enabling the bar to guide the chain respectively. All these parts must be maintained properly in order to enhance performance and safety when the chainsaw is in use. The chain catcher refers to a plastic or metal guard that is intended to protect the chainsaw operator from coming in contact with the chain in case the chain breaks or is derailed when the chainsaw is in use. The clutch is the part that joins the engine to the chain sprocket. Its main purpose is to control the cutting speed of the chainsaw. It is a very important part of the chainsaw that is designed to immediately stop the chainsaw in case a kick back occurs. This protects the chainsaw operator and significantly lowers the risk of serious injury from kickback accidents. The chain tension is very important because it minimizes damage to the chain and also enhances the safety of the chainsaw user. The right and left tensioners located at the sides of most chainsaws enable the users to regularly tension the chain with ease. This is a very important part of a chainsaw that is located strategically in order to allow the chainsaw user to easily activate it using the right thumb if need be. The hand guard prevents the operator’s hands in case of a kickback by activating the chain brake which stops the chain from running. This part releases saw compression and makes starting the chainsaw easier. This part regulates the saw’s revolution per minute (RPM). It works by increasing or reducing the volume of fuel to the cylinders; when pressure on the throttle is released, the saw chain stops running. Other important throttle valves are the throttle interlock; which ensures that the throttle handle is only activated when it is depressed and the throttle handle; which is used to grasp the back of the chainsaw. The flywheel is an important part of the chainsaw that regulates both the speed of the chainsaw and prevents overheating when the chainsaw is in use. The muffler is very important because it absorbs most of the noise produced when the chainsaw is in use, thus reducing its impact on the operator’s hearing. The chainsaw is a very powerful which when in use, produces a lot of vibration which can cause harm to the joints and the arms of the user. The anti-vibration valve absorbs most of the vibration produced hence reducing the effect it would otherwise have had on the user. The guide bar mostly made from tough steel alloy, is a curved piece of metal that mainly guides the chain and holds it firmly position when the chainsaw is in use. Its main function is to guide and support the saw chain. This part of a chainsaw provides and controls the amount of fuel that goes into the engine irrespective of what angle the chainsaw is held at. The main function of this part is to prevent any hot sparks from leaving the muffler. As the name suggests, these are parts that seal the oil and fuel tanks. These parts include the air filter which prevents saw dust and other impurities from getting in to the carburetor and the fuel filter which also serves the same purpose and inhibits dust and other impurities from entering the chainsaw’s carburetor. 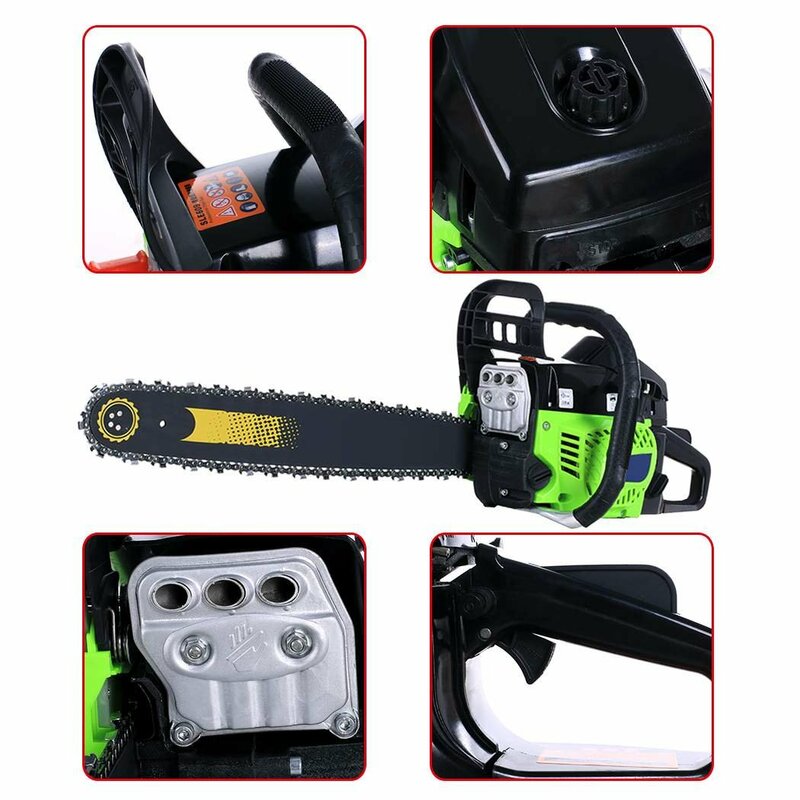 The chainsaw also has the air filter cover which is important for keeping the air filter in place while also covering the carburetor. This is a very important chainsaw part that is designed to start the engine of a cold gasoline-powered chainsaw. It starts the engine of the chainsaw by limiting air flow which results in a rich fuel-air combination within the engine.